Cluck, cluck, cluck. You’ll hear these sounds in nearly every state these days. 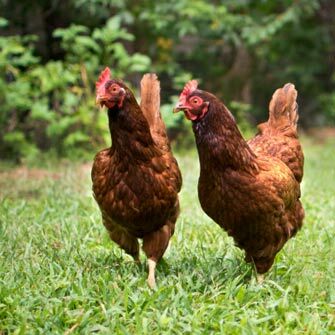 Backyard chickens have become exceedingly popular and are popping up in suburban areas everywhere. There's plenty that's appealing about these feathered pets — and plenty to consider before you get them. Believe it or not, chickens are extremely inquisitive and great fun to watch. They love to explore and investigate everything. Chickens also provide companionship, and nearly every chicken owner will tell you that these friendly birds recognize their owners and respond to their voices — they bond to their human families and can be devoted companions. Chickens also provide fresh eggs to eat. This is perhaps the main reason so many people want chickens as pets these days. There is something very rewarding about being able to step out into your yard in the morning and bring breakfast directly to your table. Chickens can also teach children about responsible pet ownership. They need to be fed and watered daily, and their coop needs to be cleaned and swept, at a minimum, once a week. Nest boxes need to be checked daily for eggs and cleaned regularly. All family members, including children, can participate in chicken care, making it a fun family experience. Unbeknownst to most people, there are over 400 varieties of chickens in the world. Standard chickens are the familiar large birds, while Bantams are much smaller, weighing only a couple of pounds. Standard chickens are kept mainly for their egg-laying abilities, as they generally produce larger eggs more frequently, while Bantams are kept more often as ornamental pets. In addition to size variation, different varieties of chickens come in different colors with varying feather length and pattern. And some chickens can also lay differently colored eggs, from the white and brown eggs you can find in the grocery store to those beautifully colored in pastel shades of pink, green or blue. Chickens certainly are appealing as pets, yet they are not simple to care for. What many people don’t realize is that chickens actually require a fairly high level of care.